President Trump often complains that the news media overlooks positive stories about his administration. But when Trump asked a reporter on Thursday why she didn't quote from a conversation he'd had on board Air Force One, the answer was simple: the White House said it was off the record. The confusion arose as Trump arrived in Paris to meet with French President Emmanuel Macron. On the flight across the Atlantic, the President had spoken with traveling reporters for more than an hour. After arriving in France, the New York Times' Maggie Haberman -- a designated White House pool reporter for the day -- chronicled a peculiar exchange she had with Trump. "POTUS asked your pooler why she didn't use what he has said last night," Haberman wrote in a pool report. "Your pooler reminded him last night was off the record." "POTUS asked if I had heard him say it could be on-record; your pooler replied truthfully no," she added. Haberman, a CNN analyst who is one of the best-sourced reporters covering the Trump administration and has known the President for years, noted in the pool report that other reporters also believed the conversation to be off the record -- because White House deputy press secretary Sarah Huckabee Sanders had said that it was. Huckabee Sanders later sent out excerpts of the in-flight conversation, which touched on the scandal ensnaring the president's son, Donald Trump Jr., as well as issues like trade, health care and Trump's proposed border wall. But those excerpts did not include a part of the exchange about Trump Jr., in which President Trump indicated that his oldest son might be willing to testify regarding his meeting with a Russian attorney. The White House later sent out that excerpt as well as two others that were not included in the original transcript put on-the-record. The off-the-record-turned-on-the-record chat came at a time when the White House has been scaling back media interactions with Trump. The President has given just one solo press conference in his first six months in office. Over the last two months, Trump has spoken almost exclusively to friendly outlets such as Fox News, although he did speak to Reuters this week. The White House press briefing, meanwhile, has been marginalized by the Trump administration. What was once a daily fixture on television, the briefing is now mostly conducted off-camera. And the question-and-answer portion of the briefing, whether it's led by Huckabee Sanders or White House press secretary Sean Spicer, is decidedly shorter than in the past. Also in Paris on Thursday, Trump broke with typical protocol at a joint press conference with Macron. 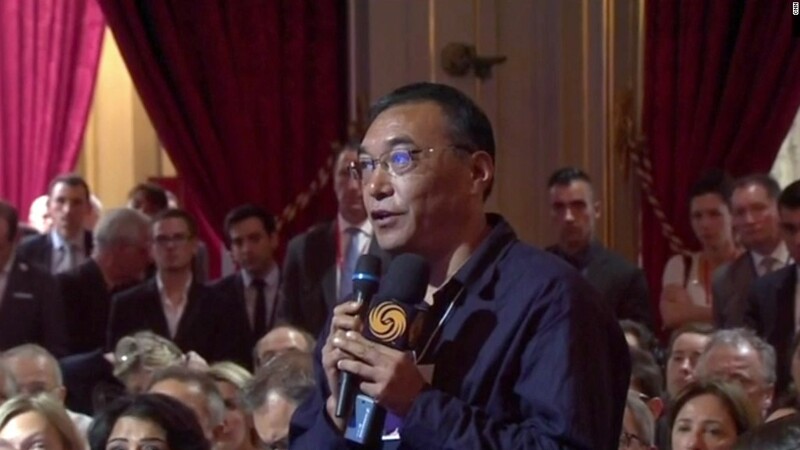 At such press conferences, four questions are typically asked -- two by reporters from the host country, and two by reporters from the guest country. But for one of his questions, Trump called on a reporter from a Chinese media outlet instead of an American. As CNNMoney has previously reported, moves like these are often part of a White House strategy intended to rile the media and make it look silly.